There are a lot of reasons for people not wanting to stay in the house you own now. You may love the neighborhood or the area is perfect for a growing family. You may be retiring and planning to move in the future, but you’ve outgrown your current home. Because our family lives, careers, and lifestyles change over time, the needs we have from our living spaces also change. Does your current house meet your needs for the way you live your life? Would you be more comfortable with more space or the existing areas redesigned to better suit your current lifestyle? Do you have enough room for the kinds of activities associated with entertaining, having overnight guests, working from home, having babies, small children, or teenagers? If the answer is no, but you are not inclined to move in the near future, we can create a new space, either by adding to your existing house (extension) or by changing and reconfiguring your existing space (remodeling). Here are some example of recent jobs we completed and how our customers have benefitted from this modification to their homes. We came into the house of this wonderful couple who have made the decision to stay in their current home for the rest of their lives. Their children were grown and it was just the two of them. Some might think this would be the time to downsize, but this couple realized that their family’s changing configuration meant their house needed more space for grandchildren and overnight guests. What had been a great house for raising a family was not going to meet their needs as their family and personal lifestyles were changing. Together we created a wonderful floor plan that gave them more living space, greater capacity for overnight guests, and open areas for better entertaining. We added a master bedroom and full bath on the first level, increasing the footprint of the home by about 1,000 square feet. This will make it easier for them to stay in the house as they age, without worrying about going up and down stairs. The upstairs remained in tact with bedrooms for their family to use when they came for visits. This project also included a redesign to open up the living room and kitchen area to make it more appealing for entertaining and added a fireplace to really enhance the area. The kitchen got an upgrade to make it modern and beautiful. We also added a patio for better use of the backyard. 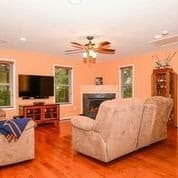 As you can see, the space is perfect for entertaining, having family visit, and single floor living. Our clients are very happy with the finished project and love their new home. Now staying in this house for the rest of their lives is going to be so much more enjoyable for them. Another project involved redesigning the space for a family with changing needs. This family had enough space before we started the project, but it was not able to be used for all of their interests. 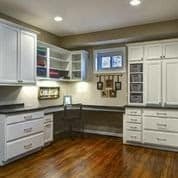 Because they had an existing basement that was not being adequately utilized, we were able to transform the entire area and meet everyone’s needs. The parents wanted a place for the kids to play, with a ping pong and foosball table. They also wanted an area for watching tv and movies. The mother of the house and her daughter love to do crafts and having their own space for that was a dream come true. 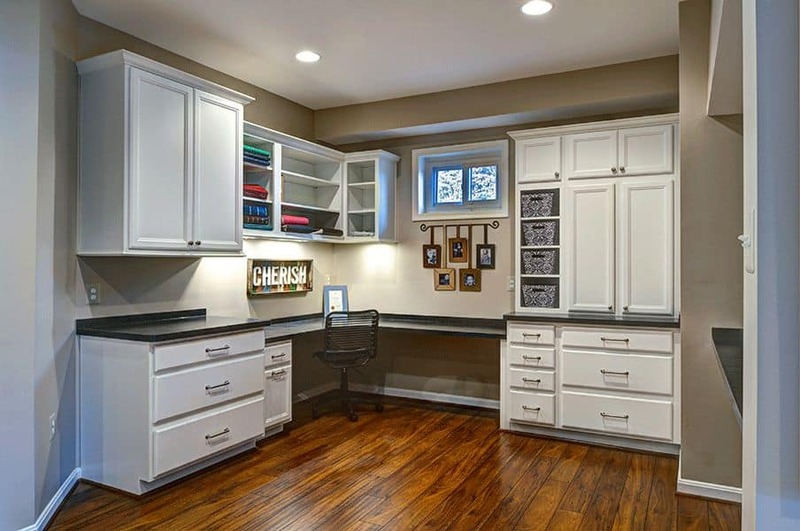 The father of the house works from home a lot and there was no office space more suitable than the basement. In addition to all of these areas, they wanted a full bedroom/bath for guests to stay. Because they had enough space, this was the perfect place to put a guest bedroom and full bathroom. This project was a tremendous success with everyone in the family having space to participate in the activities they enjoy, while spending time together as a family. They are very happy with this finished project and now their home is perfectly suited to grow with them as their family and lifestyles continues to change and develop. If you want to stay in your home but it is not completely meeting all of your needs, contact us for a consultation. 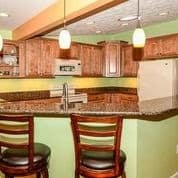 Together we can come up with the perfect extension or remodeling design to suit your wants and needs.